A very reliable workhorse printer, slightly faster processing speed than the 4000 series. This base model includes 8MB RAM, one 500-sheet tray. The transfer roller retaining tabs have been upgraded, read about that below. Upgrade options include features like network cards, duplexers, and extra trays. 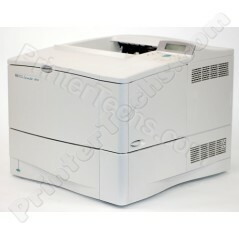 Other models in this series include HP LaserJet 4050N , HP LaserJet 4050T , HP LaserJet 4050TN. HP part number is C4251A. Hi folks! Many companies sell so-called "refurbished" printers but all they do is blow the dust off and replace a few feed rollers. Not here! Check out our comprehensive refurbishing process and technical innovations. The HP Laserjet 4050 series printer is a classic black and white laser printer. Built like a tank, this was one of the most reliable laser printers HP made. Sure, it’s a bit slow by today’s standards, printing 16 pages per minute (ppm) compared to 30-55 ppm for most current b&w Laserjets, but it is very reliable and the toner cartridge are inexpensive. If you are thinking about buying one of these printers, buy it from us! Here’s why: not only do we completely rebuild the printer from the frame up but we fix the weak spots in the transfer assembly. As these printers age, the plastic used in the retaining tabs that hold the transfer roller bushings in place gets brittle and easily breaks. 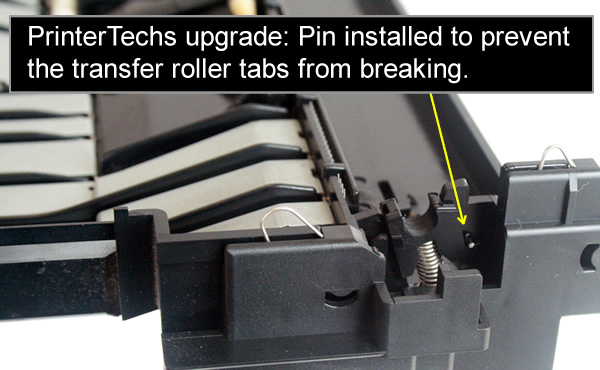 In some cases we’ve seen these tabs break simply by removing the toner cartridge. We have a simple permanent fix for this. We insert a metal pin that is sturdier than the tab that breaks to retain the transfer roller bushings. 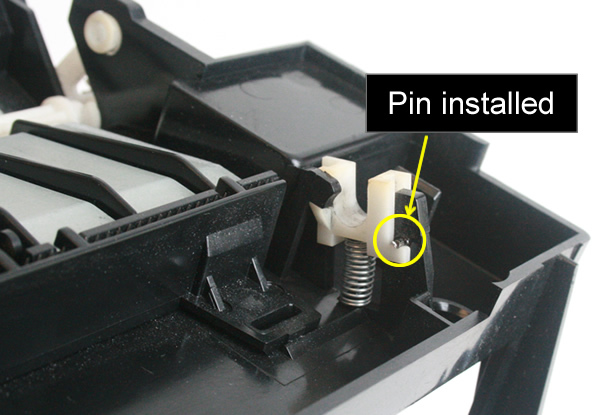 Installing the pins is time-consuming and requires disassembling most of the printer, however we have seen this problem enough recently that we started implementing this fix on all HP 4000 and 4050 printers (as of June of 2018). If you buy the printer from us we’ve installed the pins to fix this problem, if you buy it elsewhere you’re taking a chance. Our advice is that if you have a Laserjet 4000 or 4050 where the metal pins haven’t been installed don’t touch or remove the transfer roller. If the retaining tabs break you’ll either have to send the printer in to us for repair or buy another printer. If you do nothing you’ll get print defects because the transfer roller won’t stay in place. Please Note: most of our customers do not require toner cartridges, cables, manuals, or drivers. Therefore our printers are priced and packaged without these items. If you need toner cartridges or cables please add them to your shopping cart. Users manuals and drivers may be downloaded at www.hp.com. A power cord is included. 13.5" x 15.4" x 19.4"